The sound fills the room not in a single beam, but with reflections and reverberations from all the hard surfaces. A person standing a few feet in front of you senses where the sound came from but does not feel that it has been fired directly at them. This is omni-directional sound like most sounds heard in nature. A conventional front-firing speaker aims sound at a single fixed listening position and if you move from that ‘sweet spot’ you will lose the illusion of music sources positioned in a stereo image. Omni means the source radiates equally in all directions, so an omni-directional radiator is audibly superior. The sound is natural in mimicking the experience of live music performance . The ‘sound stage’ stereo imaging space is considerably expanded, thus diminishing that feeling of needing to keep your ears locked into a narrow listening position. The speakers’ behaviour tends to be quite predictable because reflected sound is matched to direct sound in tonal quality. The room size, shape, and surface textures are less influential. The sound more closely resembles that heard with large room reverberation than is the case with the narrowly directed output of typical tower-form boxed speakers. Front-firing speakers are unable to recreate the sound fields of acoustic instruments that propagate sound omni-directionally. Just like hand-claps, so pianos, violins, guitars, drums and cymbals and many other instruments are not front-firing and hence cannot be reproduced naturally throughout a listening area by front-firing speakers. The OMUNI sound output heard at the listening position is much less subject to colouration by the addition of reflected sound from room boundaries and furnishings. This is because the OMUNI has the same output on and off the listening axis, whereas a rectangular boxed front-firing speaker degrades off axis and suffers from extremely poor, bass heavy, response off the sides and back of the enclosure. Off axis sound is inevitably reflected back to the listener in some part and with the OMUNI this adds only room reverberation, whilst a front-firing speaker also adds colouration due to the poor quality of the reflected off-axis sound. The OMUNI is a two-way ‘artisan audio’ design with a downward facing 8 inch bass driver with an alloy cone in an aperiodic labyrinth. Topping this off is a 3 inch mid-high frequency driver running up to 25 Khz. The tightly matched Mid/High drivers feature leading edge alloy cone technology. “OMUNI LENS” (© 2014, All Rights Reserved. Careful consideration has been given to placement in the listening situation. 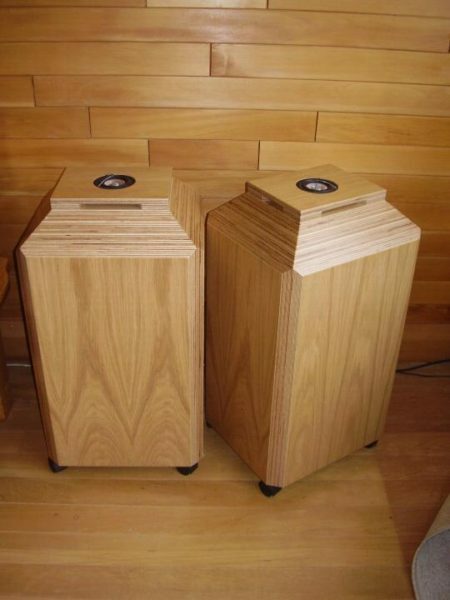 Some omni-directional speakers need to be stood well out into the room, and this can be inconvenient or aesthetically wrong alongside furnishings. The OMUNIs can be placed 30 cm or more from the back wall and not close to the corners, and because performance in each room is different, mounting on castors facilitates experimentation for optimisation. Placing them well into the room produces a spectacular soundstage, and they can be wheeled back at the end of your listening session. Hand built by our craftsman furniture maker here in New Zealand with multiplex Spruce, the enclosures will please and surprise in appearance and feel.. Indeed the top triangulated section of each speaker is a complex laminated solid block that weighs over 7 kilograms. I have been searching for a word that best represents the sound of the Omunis.